In today's world, consumers demand great customer service. Additionally, they don't want to have to wait for it. We live in the age of 'instant gratification'. In order to succeed and meet these high demands, you need to deliver a better customer care strategy. A CRM platform can be one of the best ways to support these efforts. There's nothing worse than your customers wondering whether you truly know them at all. If you have to ask them too many questions about their account, they are going to feel as though they are simply a number rather than a valued client. Most likely (we hope), your organzation already has the account information, but it is simply a matter of whether you (and the rest of your team) can access it. CRMs are designed to keep all of your customer information in one place. You can store their customer details, their purchase history, as well as any other data collected (demographic and behavioral). When you contact the customer over the phone, they contact you or if you visit them in person, you should be able to access everything on that customer so you can better address what they need and want from your organization. Data lets you take a more proactive approach towards customer care whether you are in sales, marketing or customer service. Giving your team the appropriate access to customer data helps the entire organization. Marketing get information to help build their personas, develop more relevant cotent and help better tartget their messaging. Customer service uses the contact record as a point of reference to help solve any and all issues, quickly and efficiently without having to go through multiple sources. Additionally, if you lose a salesperson or you need to hand off a customer to a different salesperson, the information is still stored. This ensures that your customer is always being given the stellar customer service that they demand. Customers want to know that no matter who they talk to that they will be given great customer service and will not have to continuously repeat the same information over and over again. If a customer has to explain the whole rundown of what's going on to everyone they talk to, it's a waste of time and they're going to get frustrated. If only a salesperson has information about the customer, it's not possible to give the best customer service. Having realtime, up-to-date access to data is an integral part of delivering optimal customer care. You create consistency and increase productivity when your sales teams, managers, technicians, and anyone else that may come into contact with the customer has some context into who they are, their motivations, their history of interactions and more. Customers want to feel as though they're in good hands. The way to do that is to make sure that you're not only giving them a consistent experience, but a personalized experience as well. CRM software is the key to delivering customized content, recommendations, promotions and more since it stores all relelvant data within the contact record. An integrated CRM stores marketing data as well, so you can see what efforts motivated them most to convert or engage in specific ways. For example, when you do a follow-up call after a purchase, you can look to see what they ordered and suggest very specific add-ons to complement their purchase. Personalized suggestions like this tend to have a high rate of conversion. Plus, when you know exactly what they ordered and the journey they went through to get there, you are able to deepen that relationship and build a trust, instead of asking the generic "how is everything going? ", non-personalized approach. Utilizing a CRM can be just what you need to overcome obstacles and provide a better level of service. Your goal should always be to provide the highest level of customer care possible. 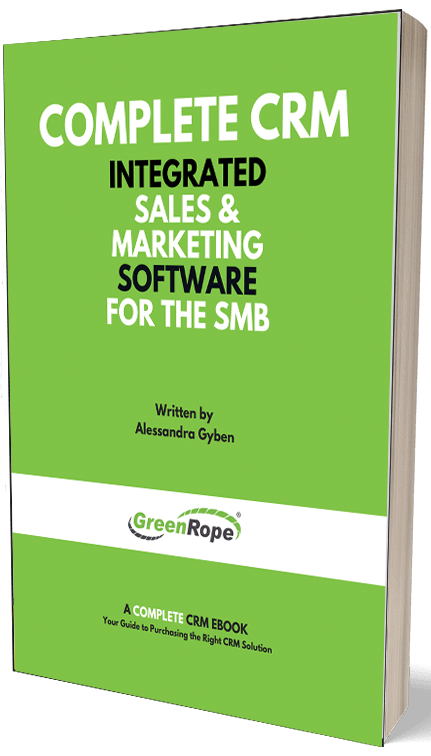 At GreenRope, we provide CRM tools as well as a full marketing automation platform. We provide you with the integration needed to make a difference so that data is always accurate and productivity at an all time high.